Electrical substations are crucial for transmitting electric power between the generating station and consumers. Therefore, inspections must be conducted periodically in order to identify potential safety hazards and prevent power failures. In the past, these inspections were mainly conducted by inspection officers. However, the likelihood of errors and negligence was high due to the heavy inspection workload in large-scale substations, as well as the potentially harsh and challenging working conditions in remote substations. Thus, full-time inspection robots have become an increasing trend in recent years, especially for substations that are unmanned or have minimal personnel. 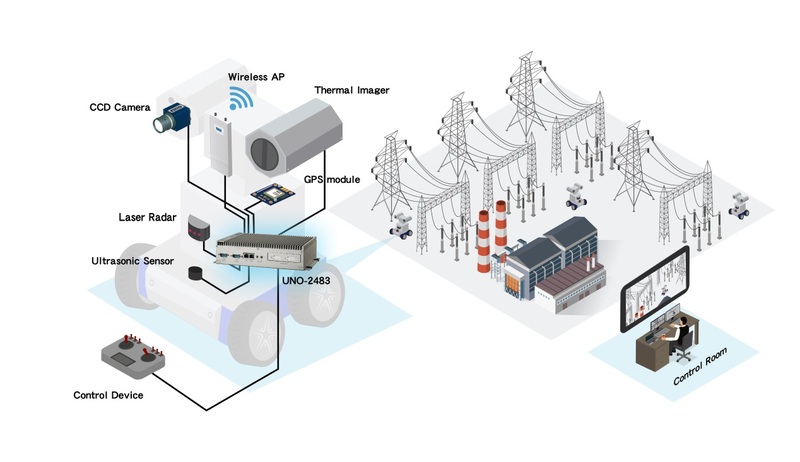 The general operations of a typical substation inspection robot are as follows: First, inspection instructions are transmitted wirelessly from the control center to the robot, which then carries out the instructions following a designated route. Along the route, the robot captures high-resolution images, measures temperature using an infrared thermometer, and then transmits the data back to the control center. If an abnormality is detected, the inspection robot notifies relevant personnel by emitting an alert signal. After completing the assigned inspection task, the robot returns to the recharge room for automatic recharging or enters standby mode to await the next instruction. To conduct these tasks accurately, inspection robots require additional functionalities and hardware devices, which necessitate a powerful embedded computer to function as the control center. Advantech’s UNO-2483G and UNO-2272G are high-performance, fanless, embedded computers capable of conducting massive and complex computing tasks. Their compact, optimized design can withstand extreme outdoor environments and are suitable for limited-space installations. With the inclusion of multiple I/O interfaces and iDoor technology, UNO-2483G and UNO-2272G support flexible expansion and integration with various hardware devices according to specific applications. Additionally, with the dedicated support of Advantech’s R&D team, system integrators can rapidly develop inspection robots for conducting inspection tasks. The client for this project was a high-tech company located in China and dedicated to the provision of software/hardware development and system integration services to the electric power industry. 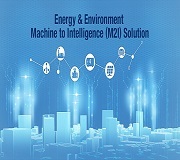 The company is constantly applying new IT technology to smart grid, power distribution and control, power distribution and transmission, substation management, and other related applications. Based on its pioneering research and successful field solutions, the company has gained quite a positive reputation and substantial consumer recognition. In recent years, the company has begun developing substation inspection robots for remote monitoring applications in an effort to support/eliminate the need for inspection personnel. Because multiple hardware devices are required for inspection robots to perform inspection tasks, the company requires highly functional and durable embedded computers for controlling the inspection robots. 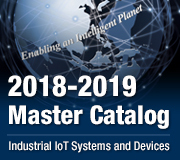 Advantech’s UNO-2483G and UNO-2272G fanless embedded industrial computers serve as competent robot controllers. These systems can be easily connected to wireless access points, GPS modules, CCD cameras, infrared thermometers, digital signal processors, etc. via multiple I/O interfaces. When installed in a robot, Advantech’s UNO computers are capable of processing images, videos, e-maps, and GPS positioning data at high speeds. These capabilities enable substation inspection robots to complete various tasks, such as receiving instructions, conducting inspections, capturing images and data, uploading images, emitting alert notifications, and automatically returning to the start point after a task is complete. For this project, the standard substation inspection robot was equipped with UNO-2483G. Because the system is compact (252 x 149 x 62 mm) and lightweight (1.6 kg), UNO-2483G can easily fit into the robot’s limited internal space. The comparatively lower weight also reduces wear on the robot wheels. Moreover, UNO-2483G features an Intel® Core™ i7 processor capable of high-volume, high-speed data processing. Thus, complex computing tasks involving images and videos can be easily completed. Meanwhile, the simplified substation inspection robot was equipped with a palm-sized UNO-2272G computer. This small (157 x 88 x 50 mm) and lightweight (0.8 kg) system features an Intel® Celeron® J1900 quad-core processor to enable high-performance computing for complex tasks. Both UNO computers are fanless, equipped with a solid-state drive, support a wide operating temperature range (-20 ~ 60 °C), and have passed IEC anti-vibration and anti-shock tests to ensure reliable operation. Additionally, both computers provide a variety of I/O interfaces, including serial ports, Ethernet ports, USB, DisplayPort, audio input/output ports, for a wide range of industrial applications. 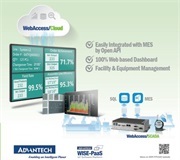 Furthermore, Advantech’s iDoor technology offers system integrators flexible expansion that overcomes the fixed specifications of embedded computers. This enables users to integrate diverse modules in order to add additional functions according to their application requirements. In today’s society, which is heavily reliant on electric power, maintaining a stable power supply is vital because it has a substantial role in everyday life and economic development. Accordingly, because they enable real-time reports, advance alerts, reduced maintenance, and enhanced efficiency, demand for substation inspection robots has increased significantly. However, whether a substation inspection robot can accurately follow instructions and complete inspection tasks depends solely on the performance of its embedded computer. 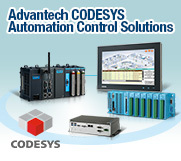 Advantech’s UNO-2000 series of embedded computers offer cost-effective solutions for control applications. They satisfy the size, performance, durability, stability, and expansion flexibility criteria required for installation in substation inspection robots. 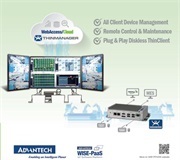 More importantly, Advantech can leverage its years of development experience and domain expertise to assist system integrators with developing new products for automated substation inspection applications.